KANSAS is born on 15th June 2016, it is a partnership firm. The main objective of us to provide Multi-Recharge to the channel partners and dealers thereby enable the customers to have the ease of recharge for Prepaid, DTH, Datacard recharge services & EB Bill payments Money Transfer/Payment Gateway, Travel services - Bus tickets/Hotel booking/ Flight tickets & Insurance premium payments in India. "To provide quality service and maintain good rapport with the Channel Partners"
"To offer optimum ROI for the channel partners with small investment and no more additional setup"
"To create happy Beta Customers"
KANSAS established in the year 2016, we are the trendsetters for Multi Recharge Systems, which enables a person to complete M-recharge, DTH recharge and Datacard recharge services & EB Bill payments Money Transfer/Payment Gateway, Travel services - Bus tickets/Hotel booking/ Flight tickets & Insurance premium payments in India. KANSAS is one of its kind solutions for instant mobile recharge. 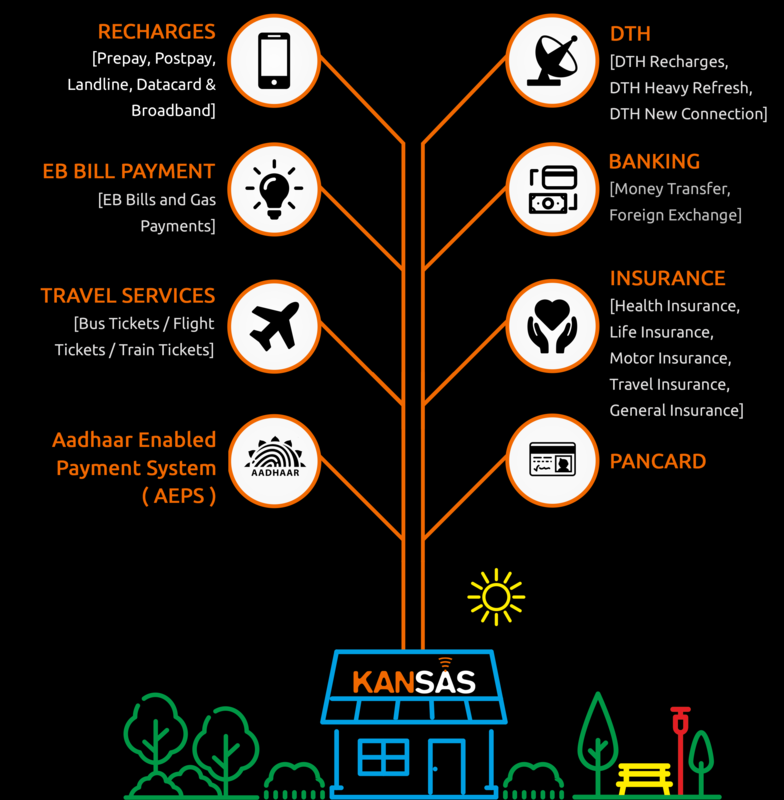 KANSAS is an online platform, focused to provide customers with an electronic transaction for the mobile or DTH bill payment as well as the retailers, an opportunity to explore the market of online-recharges, without any heavy investment! We offer online mobile and DTH recharge services for all the prominent operators of India. We have a tie-up with leading mobile operators including – Airtel, Vodafone, Reliance, Tata-Docomo, Idea, Aircel, BSNL and MTS along with these, we are also proud of our DTH and Data-Card network, enabling the users to pay their bills for the following operators – Tata Sky, Reliance BIG-TV, SUN Direct, Airtel Digital TV, Videocon D2H, Dish TV, Tata-Photon and Reliance Net-Connect. Ours is an accessible, adaptable and convenient podium to get all your recharges done, without splurging any exorbitant fees. You can get the top-up done with our uninterrupted API automated systems in microseconds, with 100% success rate and secured payment platforms! KANSAS provides a pedestal to the retailers, to earn hefty sum in an easy way every month! The extremely low cost distribution of e-vouchers reduces the cost of warehousing, shipping, invoicing and payment collection, thus increasing the profit margin and making the retailer independent and tension-free. Gone are the days when mobile recharges were done with different devices, each manning one operator or the retailers storing paper-coupons to provide recharge services to their customers. We are offering you a fundamental solution to all these problems by introducing our API automated system. We offer a strong-backend support through our flawless services. With KANSAS, retailers have had a vivid experience of working online and earning decent amount – all without having to worry about the stock getting over! With us, you are assured of a fully customizable as well as secured gateway for your transactions and valuable payments. A simple API will empower you to provide recharge services to as much as 15 leading telecom operators of India, without having to maintain multiple devices for each operator or paper-based recharge coupons for your consumers or even worrying about maintaining different stocks for different operators. You can maintain a centralized stock for all the operators at one place. Ours is a quick and seamless interface, providing customizable services. We accept any denominations, thus expanding the market for the retailers and giving them the opportunity to explore the consumer-market at their convenience. No need to have separate balance or mobile phones for different operators when you can have a single functioning for every operator from a single device! Your current balance, the balance you spent from your account and the number of transactions that you make each day, can be viewed any time! There is no limit to number of transactions you make each day! 87, Bharathiyar Road, Maniyakaranpalayam, Ganapathy (P.O), Coimbatore - 641 006. © Copyrights 2017 KANSAS. All Rights Reserved.